For John Roberson, CEO of Advent, the answer to this question is the difference between sinking and swimming in today’s competitive higher ed landscape. 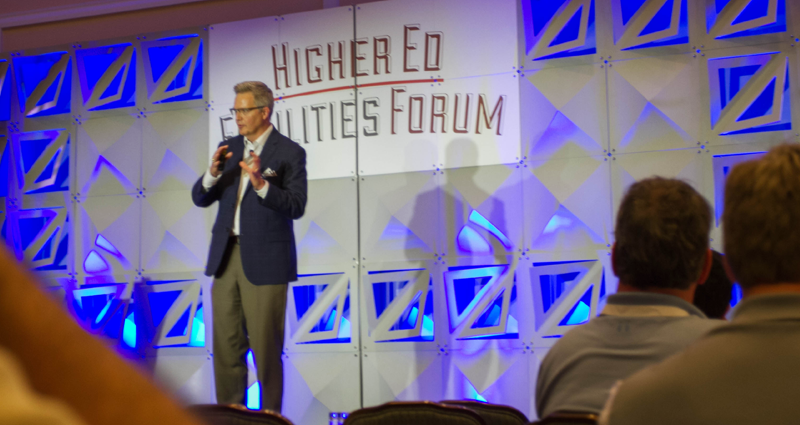 At this year’s Higher Education Facilities Forum in Hollywood, FL, Roberson discussed how finding and communicating your university’s identity via engaging campus facilities is the key to gaining a natural edge in the marketplace. Standing out in a way that’s authentic, meaningful and relevant is more crucial for colleges than ever; in fact, it’s what’s keeping your boss up at night, according to Gallup’s research from July 2015. Among 4,200 university presidents, differentiation from the pack was ranked the number one highest stressor. Between rising tuition costs, the explosion of online education, and a surge in mobility among students, universities that differentiate their authentic brand story can gain a substantial competitive advantage. With your audience present on your campus, there’s no one else to compete for their attention, presenting a powerful opportunity to connect. Nashville-based Advent does just that, partnering with universities and corporations to create inspiring spaces that promote shared experiences. Advent visually expresses brand stories for clients from Penn State to the Dallas Cowboys with innovative problem-solving, targeted messaging and dynamic technology. With so many colleges focused on repetitive qualities (think ‘community’ or ‘academic excellence’), clarifying your institution’s unique attributes sets you apart from the Higher Ed herd. "Each college campus is a collection of stories that make a statement about the community," said Roberson. So, how do you create a place that communicates your special value and compels people, thereby improving recruitment, retention, profit and more? 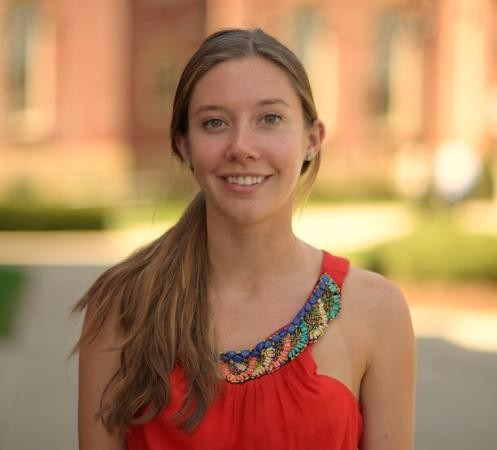 "Each college campus is a collection of stories that make a statement about the community." Not by hoping your grandmother’s stories will be passed on by a booming tour guide’s megaphone, or relying on architects alone to be accountable for story-centered spaces. Instead, Roberson stresses that incorporating your narrative must be done in a methodical, planned way. This trifecta was the recipe for success in Advent's successful collaboration with the University of Southern California, which resulted in the 110,000-square-foot John McKay Center to symbolize the school's long tradition of athletic excellence. In an effort to express the rich history and bright future for Trojan athletics, the All-American Walk was born. Two USC alumni were so moved by the conceptual sketch, which sought to evoke the transcendence of the All-American, that they funded the project. 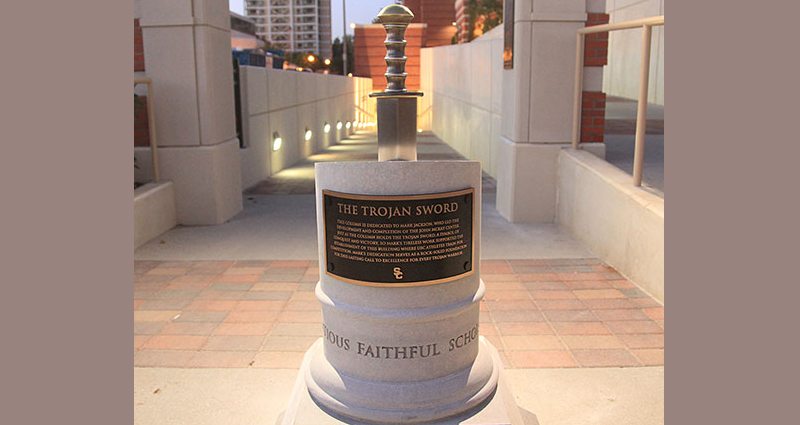 The result was a grand pathway from the locker room to the field, featuring bronze plaques, a display of the Trojan sword and an explanation of the mighty Trojan attributes to both honor USC’s greatest Trojans and inspire a bright future. The engaging new experience was successfully embraced by USC’s fans, who took to Instagram and Twitter with no prompting. This social media recognition raised USC’s visibility, effectively building their brand among the target audience. And the All-American Walk has already proven the power of storytelling, inspiring football player Marqise Lee as he passed the plaques each day to have his accomplishments enshrined. "I walked by this for a year, and I set it as my goal to be on that wall," said Lee, who grew up as a ward of the state with the odds stacked against him, and went on to earn an All-American. With Lee and other aspiring athletes motivated by the wall, the value created from differentiating spaces comes full-circle: as your audience benefits from inspiring facilities, they go on to differentiate your institution through their exceptional accomplishments. It's not just the football field where these moving stories are found: academic spaces provide just as impactful of a messaging opportunity. Using your campus to promote meaning is especially critical when it comes to attracting Millennials (born 1980-1995) and Generation Z (born 1996-2012), the college-age generations that consistently express a longing to be connected to something larger than themselves. These generations place an emphasis on consumer-based experiences that put them in the driver’s seat to define. "On social media, Millennials and Generation Z curate a narrative of their life through these mountaintop experiences through which they’re involved," said Roberson. "They want 'likes' to validate a worthy experience." 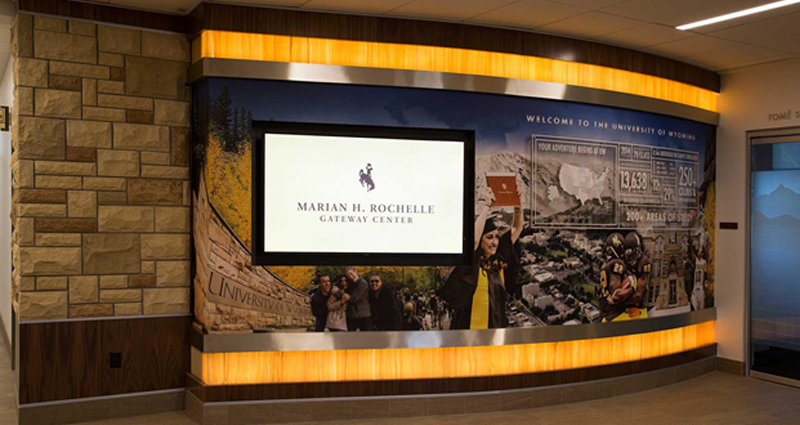 Cue interactive spaces, like the University of Wyoming’s experiential 30-foot wall timeline. Located in their new welcome center, the wall includes two rolling screens that travel through each decade with dynamic content that comes to life for each user. Another Advent partnership included Western Kentucky University, who wanted to stand out with a bold statement about their global connections. With an influx of inbound and outbound study abroad students, they implemented messaging that you can't miss, with signposts signaling the school's proximity to foreign cities from Paris to Hanoi. 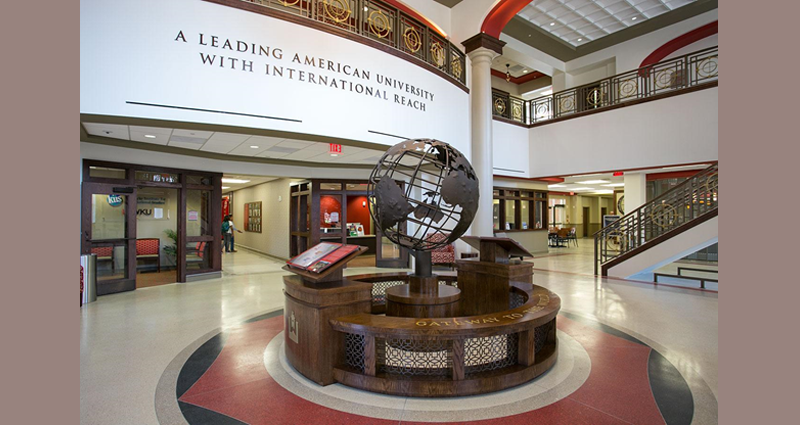 Visitors to the International Honors College are greeted by a bronze globe ‘Gateway to the World’ centerpiece, while an ‘Adventures of the Red Towel’ display features students waving the red towel at locations all over the world, reinforcing a sense of international connection and forging loyalty. Roberson also discussed a project still in concept design at USC’s Marshall School of Business. To show the worldwide impact of Marshall alumni, a video wall is currently under construction where users can tap on points of engagement to see the diverse projects and work alumni are completing all over the world. The bottom line is that your campus is your canvas. When your facilities reflect your identity, you truly make your institution matter. Using these spaces intentionally is an invaluable strategy to connect and engage your campus and community. What kind of statement will you make? To see John's full presentation, watch the video below. Enjoy!